Previewing a page involves rendering the source code in order to see if it is how you wanted it to look before actually saving (or exporting) the page. For simple syntax such as bold or other text formatting, the preview feature works well. 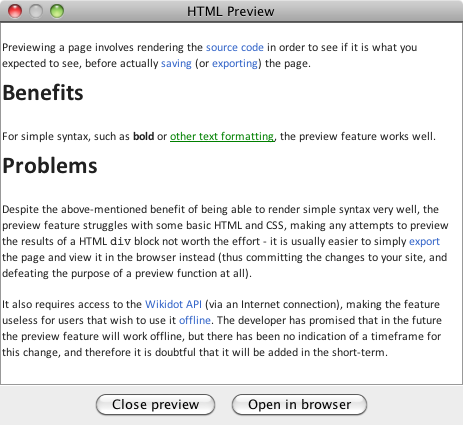 Despite the above-mentioned benefit of being able to render simple syntax very well, the preview feature struggles with some basic HTML and CSS thus making any attempts to preview the results of a HTML div block not worth the effort – it is usually easier to simply export the page and view it in the browser instead (committing the changes to your site and defeating the purpose of a preview function at all). It also requires access to the Wikidot API (via an Internet connection), making the feature useless for users that wish to use it offline. The developer has promised that in the future the preview feature will work offline, but there has been no indication of a timeframe for this change and therefore it is doubtful that it will be added in the short term. Below is a screenshot of part of this page's source code being rendered as a preview in STE; basic formatting works really well.